Insect bites and stings are common and usually cause only minor irritation. However, some stings can be painful and trigger a serious allergic reaction. Insects that bite include midges, mosquitoes, fleas, bedbugs and although not strictly insects, spiders, mites and ticks, which are arachnids. 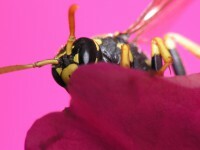 Insects that sting include bees, wasps and hornets. An insect bites you by making a hole in your skin to feed. Most insects sting as a defense by injecting venom into your skin. A small lump usually develops which is usually very itchy. A small hole, or the sting itself, may also be visible. The lump may have an inflamed (red and swollen) area around it that may be filled with fluid. This is called a weal. Insect bites and stings usually clear up within several hours and can be safely treated at home. However, some insect bites and stings may cause an allergic reaction and symptoms can include swelling, redness, pain, dizziness, loss of breath, and anxiety. Caution: If you experience symptoms such as flushing, generalized hives, swelling around the neck or tongue, difficulty breathing, faintness, or loss of consciousness or diarrhea after you are bitten or stung by an insect, immediately consult your physician or go to the emergency room. Take vitamin C as soon as possible, along with vitamin B5. Vitamin E applied topically can also help.